Each month we host a Graphic Novel Book Club meeting, open to all, during which we hang out and informally discuss a featured graphic novel. 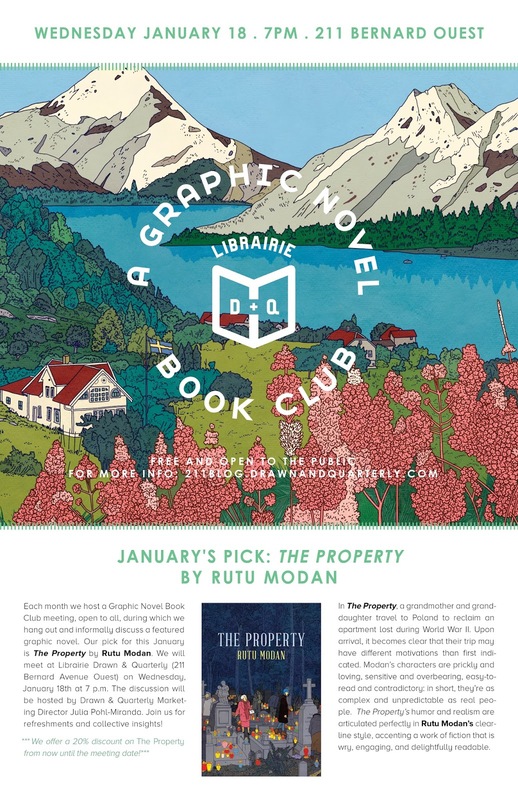 Our pick for January is Rutu Modan’s THE PROPERTY! We will meet at Librairie Drawn & Quarterly (211 Bernard O) on Wednesday, January 18th at 7:00 p.m. The discussion will be hosted by D+Q marketing director Julia Pohl-Miranda. Join us for refreshments and collective insights! **We offer a 20% discount on THE PROPERTY from now until the meeting date. In THE PROPERTY, a grandmother and granddaughter travel to Poland to reclaim a property lost during World War II. Upon arrival, it becomes clear that their trip may have different motivations than first indicated. Modan's characters are prickly and loving, sensitive and overbearing, easy-to-read and contradictory: in short, they’re as complex and unpredictable as real people. THE PROPERTY’s humor and realism are articulated perfectly in Modan’s clear-line style, accenting a work of fiction that is wry, engaging, and delightfully readable.